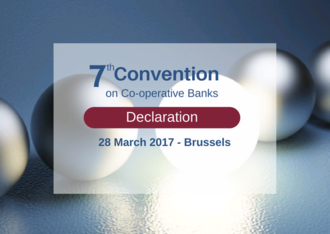 Brussels, 28 March 2017 - Renewed commitment to the European project, support for the Digital Single Market, subsidiarity, proportionality, diversity, recognition of the co-operative banks peculiarities, the need of continuous cost-benefits analysis and a simplified approach to avoid disproportionate implementation costs, were among the policy recommendations discussed today at the 7th Convention on Co-operative Banks in Brussels that gathered about 150 European and international policy makers, regulators, supervisors, academics and co-operative bankers. The event, organized on a biennial basis by the European Association of Co-operative Banks (EACB), is a landmark appointment that serves as platform for discussion to foster new thinking on the sector. Focused on the theme, ”Co-operative banks: looking ahead to drive societal and economic growth”, the event has illustrated the strategies of co-operative banks adapting to regulatory and technological developments with a keen proposition to remain key actors in their local communities. To that purpose, 10 recommendations were listed by the EACB in the “Co-operative Banks Declaration: the way forward” released today. 1. As key actors at local level with 4.050 regional banks in Europe, co-operative banks are major players in the EMU and European Banking Union. 2. 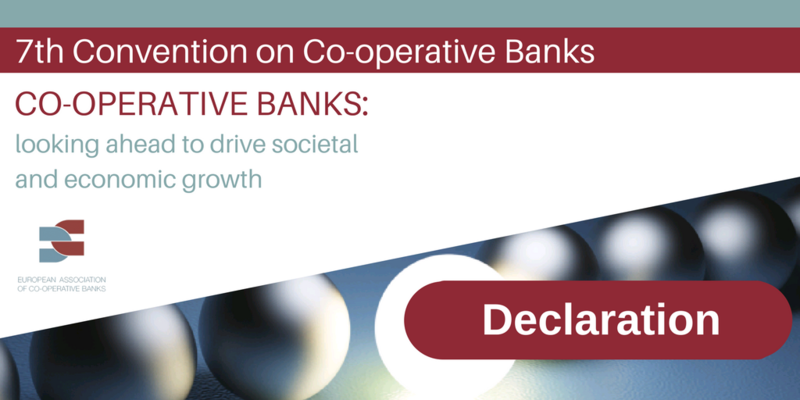 Co-operative banks are strongly committed to the European project and its values (i.e. democracy and solidarity) that we support since the foundation. Thus we welcome the initiatives of the European Parliament, the EU Council and the EU Commission, with its White Paper, to launch a debate on the “Future of Europe”. We encourage and look forward to the further thematic papers and next steps. 3. In the reflection of the future of Europe, we emphasize the importance of the subsidiarity and proportionality principles in the EU decision making process - in line with the co-operative banks model. Operating with a bottom up approach in decentralised networks, co-operative banks are accountable to local members and committed to local presence. 4. The principle of diversity is also key. Diversity lowers the risk of market disruption. Therefore the construction of Europe shall reach the right balance between more harmonisation and market purpose or needs. Normalisation is not a goal per se. 5. Policy makers shall carefully consider the adverse effect of one-size-fits all approach towards the banking sector. Too much emphasis on standardization in areas of business models, governance and scale - as well as consolidation of the sector - may lead to marginalisation of co-operative banking institutions with adverse and threatening effects on eco diversity, with detrimental impact on competition and stability, but also exclusion of certain customer and economic segments of society. 6. We call regulators to reflect the particularities of the co-operative banking model and its governance in the EU and international regulations. Moreover when implementing Basel Committee’s reforms and other international regulatory initiatives EU decision makers shall remain mindful of the specificities and strengths of EU retail banks and markets, in order to avoid distortions to competition and negative impact on EU financial stability and growth. 7. In the context of the Banking Union, the role played and benefits produced by the solid and strong Institutional Protection Schemes and solidarity mechanisms of co-operative banks must remain central. In the Single Resolution Mechanisms, recovery and resolution tools should remain mindful of the different legal and ownership structures. 8. Co-operative banks call for thorough cost-benefit analysis for quantifying the cumulative impact of regulatory initiatives on co-operative banks. Quantitative impact on real economy and end-user such as consumer and SMEs shall also be included. If regulation leads to reduced local presence and communities unserved by co-operative banks, with shadow societal effect and broad economic costs, that shall be seriously taken into account. Moreover, we recommend a continuous ex post assessment via retrospective cost-benefit analysis. 9. The growing complexity of the current regulatory landscape and its continued motion lead to disproportionate implementation and compliance costs. Paradoxically, rising regulatory costs are complicating the internal capital generation capacity of co-operative banks, since they heavily rely on retained surpluses. (2) Thus co-operative banks ask for a simplified approach that takes into account the nature, risk profile and scale of operations of the institutions including their human and IT resources. 10. Co-operative banks embrace technological innovation and support the Digital Single Market. They are re-designing their proximity models making use of the opportunities offered by digitalisation while putting members and customers and their economic and social empowerment first. In order to support the digital transformation we believe that the regulatory environment, with a view to issues mentioned above, plays an important role, and that – in particular for customer data - a levelplaying field with other digital financial services providers is necessary.